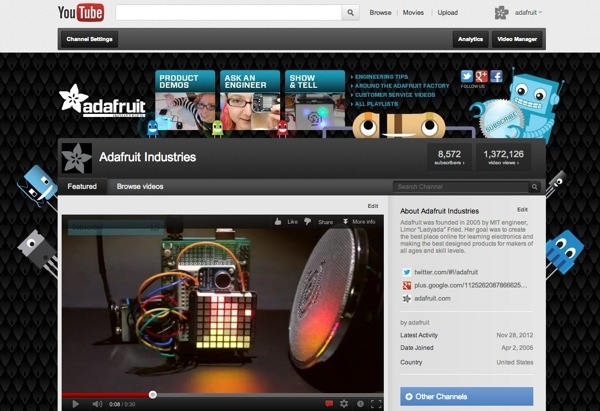 Adafruit Holiday Gift Guide 2012 — Internet broadcaster, LIVE video maker (Also known as how we do ASK-AN-ENGINEER and SHOW-AND-TELL) « Adafruit Industries – Makers, hackers, artists, designers and engineers! This guide is a little different, it’s more of a “how-to” (buy/use stuff) to make your own internet show like Adafruit’s ASK AN ENGINEER and SHOW-AND-TELL. 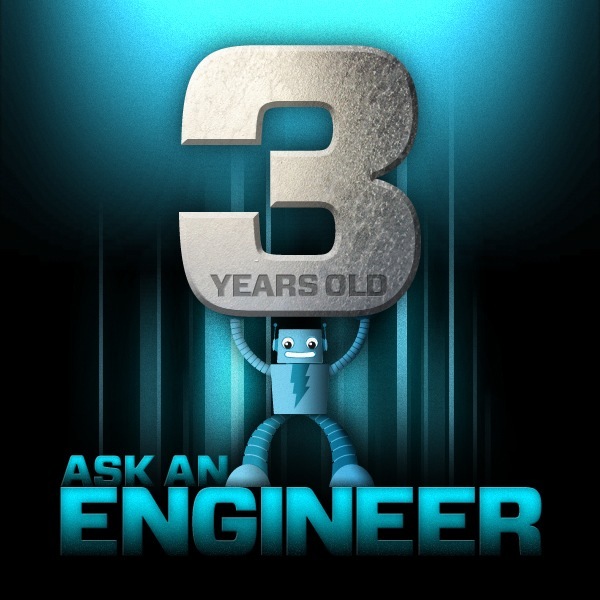 For the last 3 years every Saturday night at 10pm ET we’ve broadcasted a live video show called “ASK AN ENGINEER” – a few hundred to a few thousand folks show up, they all tune in to the latest news in electronics, open source hardware, projects from Adafruit and have their engineering questions answered live. We have guests, news, product debuts, special segments and more. It’s a lot of fun and we’re thankful for such a great community and audience who have helped us build the show all these years. 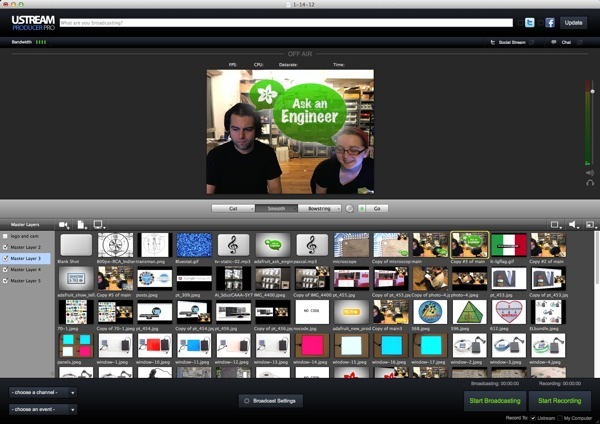 Recently, we started doing a LIVE show-and-tell using Google+ Hangouts where makers around the world show their project. We’re often asked what camera we use, software, computer, etc – so this is guide just for that. We’re hoping this is useful to someone who wants to make their own weekly LIVE electronics show! Let’s get streamin’ ! For ASK AN ENGINEER we started out using one of the low-cost Shuttle shipping stations here at Adafruit, eventually we started using whatever laptop Phil has since he works on the show throughout the week. Over time as internet connections and web cameras got better, we’ve used the latest MacBook Pros to broadcast. We are currently using a MacBook Pro 15-inch: 2.7GHz Quad-core Intel Core i7 with Retina display and 16GB of RAM. For the IRC chat & show notes we use a secondary computer, it’s usually an older spare computer around here. We used free webcams that we received in a goodie bag from a tech conference up until a couple years ago, we’ve since upgraded to HD Pro Webcam C920s. They auto-focus, work on Macs and have been good in low light. 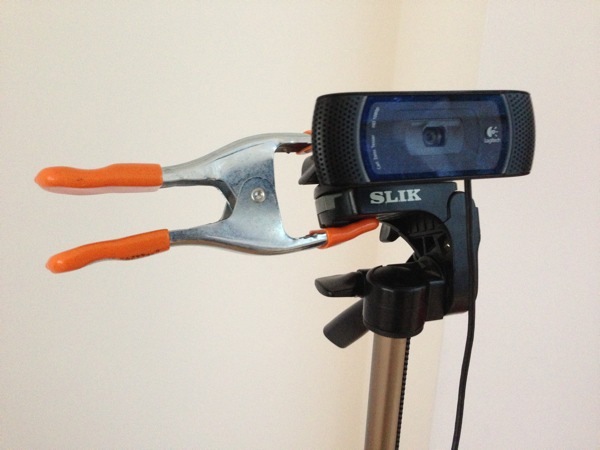 These cameras work great with Google+ hangouts LIVE and Ustream Producer Pro. 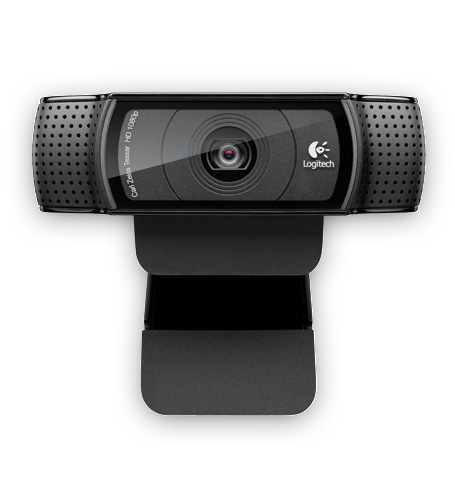 We are currently experimenting with the Logitech Broadcaster Wi-Fi Webcam, we have nothing to report yet – but we’ll be using it for some special broadcasts soon. 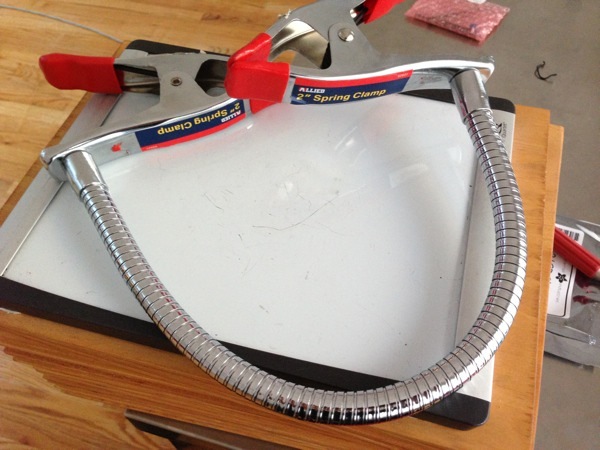 We use tons of these spring clamps to hold cameras, parts and more. The whiteboard is to draw out schematics and more, we found this one in the trash near Wall Street. Ustream Producer Pro. You can start out with the free version and see if it fits your needs, we wanted lots of control of photos, additional videos, multiple cameras, picture in picture, overlays, HD, auto-broadcast to iPhones/iPads and mobile devices like Android phones. 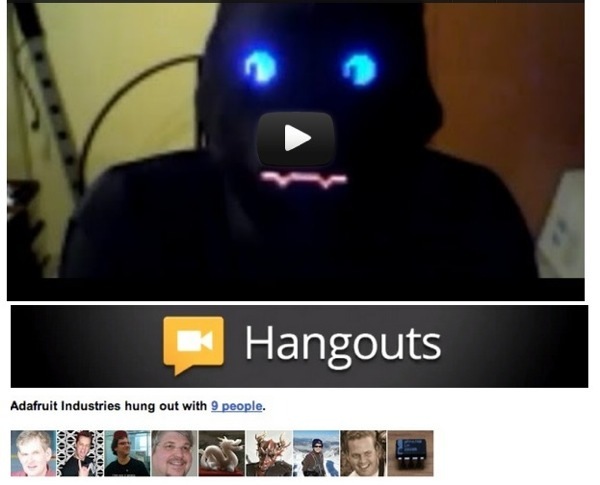 For the SHOW-AND-TELL we use Google+ Hangouts and it automagically records and uploads to our YouTube account. For the IRC chat we use Colloquy for Mac. 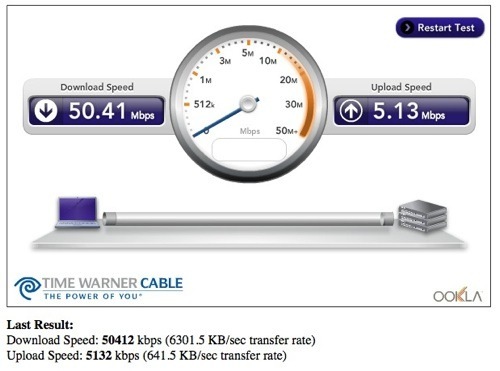 We use Time Warner business class with 50 down and 5 up. Now we’re broadcasting in HD each week. Pro-tip, avoid any video broadcasting over Wi-Fi – it just does not work out that well, use a wire 🙂 Ethernet cable. 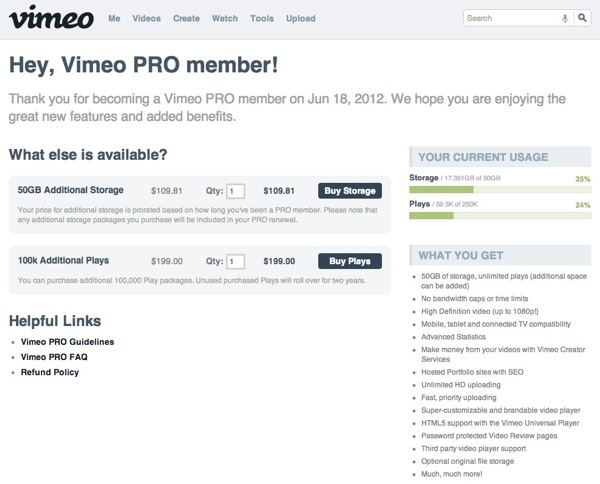 Vimeo Pro account – We use the Ustream service to broadcast (it can record) but we like to add the chat along side the video in post production. Each week we (with our video producer George) record the shows, edit them to include the text chat and upload the video to our Vimeo plus account. YouTube (free!). We love it! Please subscribe! Ad-free Ustream Premium membership. $3.99 per month. Premium, members can watch all their favorite shows without pesky advertisements. He is a shelter cat that was adopted, all internet shows need a cat to show up at the end of the broadcast (rule #117 of the internet broadcast’s guild). Mosfet is getting older and requires special food, but there is a local pet store that stocks it. He also requires 1-2 catnip-mouse-feather toys every 3-4 months. 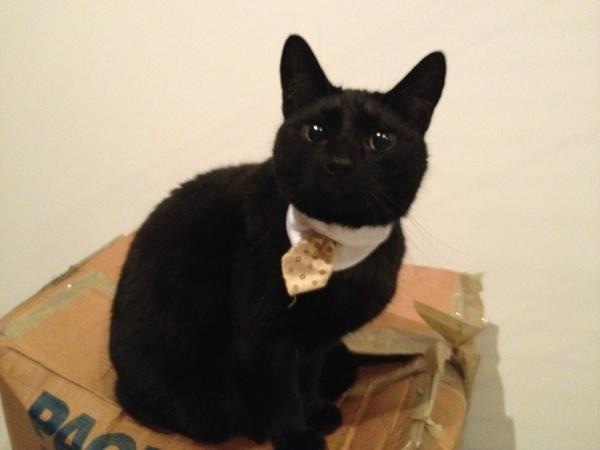 He occasionally wears a tie when he needs to be boss cat. ZED-14 Mixer board. 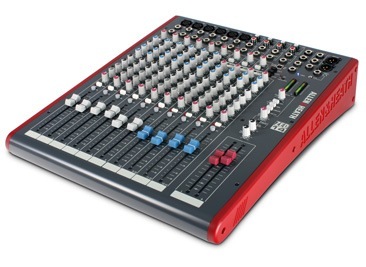 ZED-14 is a fantastic entry-level mixer for small bands, solo performers or AV applications. Its comprehensive feature set, compact size and fine lines combine to make it one of the best small mixers around. Provided with configurable USB audio in/out makes it easy to capture stereo recordings, 6 mic or line inputs, 4 stereo inputs with EQ, there are an incredible 157 controls on the front panel of the ZED-14. 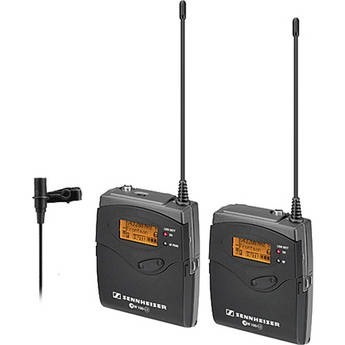 Sennheiser EW112-p G3 Camera Mount Wireless Microphone System – A (516-558 MHz). The Sennheiser EW112-p G3 Wireless Portable Microphone System is intended for portable wireless operation, such as video and field recording applications. This camera-mountable system includes a UHF diversity receiver, bodypack transmitter and ME2 lavalier microphone. The SK100 G3 bodypack transmitter and EK100 G3 receiver synchronize channel and frequency at the touch of a button. Impact Octacool-6 Fluorescent 2 Light Kit with Octabox (6 Lamps). 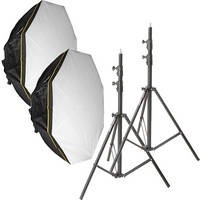 The Impact Octacool-6 Fluorescent 2 Light Kit with Octabox (6 Lamps) is a great choice for the photographer or videographer seeking a broad, flattering light source with unique fall-off characteristics for portraiture, fashion or events. Octagonal-shaped light sources have long had a reputation as the preferred portrait-shooter’s light source. The shape offers an especially large surface area which produces that legendary “wrap-around” light, which envelopes the subject while creating natural-looking catchlights in the eyes. If you like our show you can also vote for it here!